Ekiti State Governor and Chairman of the Peoples Democratic Party (PDP) Governors’s Forum, Mr Ayodele Fayose, in the early morning on Wednesday foiled an attempt by operatives of the Department of State Services (DSS) from arresting Apostle Johnson Suleiman of The Omega Fire Ministries World wide in Ado Ekiti. Johnson Suleiman The firebrand Pastor was alleged to have been preaching against Islamizing Nigeria and asked members of his church in Auchi, Edo State to resist the killings by suspected Fulani herdsmen, who he alleged of targeting Christians for decimation. The Pastor who was in Ado Ekiti for a two-day crusade that was also attended by Fayose was trailed after paying a courtesy visit to the governor at the Government House to his hotel room by the operatives of the DSS in Adebayo area of the State capital who almost forced their way to his room but were resisted by security men of the hotel that insisted to know their mission. Sensing the danger, the Pastor was alerted and he called Governor Fayose who personally led a rescue mission to prevent the abduction of the Pastor and took him to safety. The Pastor who narrated his ordeal around 2am said, “I came to Ado Ekiti for a crusade. But I had a premonition that I was being trailed after I preached that Christians should retaliate any attack or killings by the Fulani herdsmen. These Fulani herdsmen had turned many Christians to orphans and widowers but the time has come to protect ourselves. “I received several calls from hidden numbers trying to locate where I am and I had warned my security not to allow any Fulani man to come nearer me. So when the men of DSS came in the middle of the night I knew their mission and I had to call the Governor because if they arrest me, they will put this country in fire”. 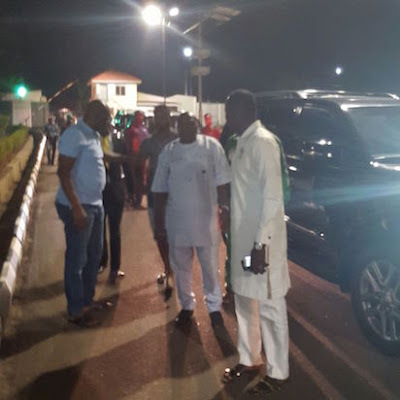 Governor Fayose, who expressed surprise that a man of God was been trailed to be arrested by the men of DSS said, he expected the security operatives to invite him “ if they have any issue with him instead of arresting him in the dead of the night after a powerful and spirit-filled crusade in my State. The Governor said, “I personally attended his crusade and I think it is wrong for a man of God who is armless that could be invited if they have any issue against him. Are Christians and Moslems under different dispensation of the rule of law? . That’s why I went there to rescue him. Let them kill two of us together. But when they saw my vehicles and the crowd, they fled. “But we have information that instructions came from DSS in Abuja that the Pastor should be arrested. We are not in a fascist state, Federal Government must learn to respect the rights of Nigerians and freedom of expression”. Governor Fayose noted that it was unbecoming of the Federal Government to be harassing the clergymen in the country noting that the General Overseer of Redeemed Christian Church of God (RCCG) Pastor Enoch Adeboye was harassed and forced to resign shortly after he visited him in Ado Ekiti. He said, “This is unacceptable, We are in a democracy and Nigerians should warn the Presidency against putting this country on fire because religion is an emotional thing”. The governor also warned security operatives against intimidation and arrest of men of God in the interest of peace and religious harmony in the country. The constitution guarantees freedom of worship”.